Fibroblast growth factor receptor 1 (FGFR1) a tyrosine kinase receptor, plays important roles in angiogenesis, embryonic development, cell proliferation, cell differentiation, and wound healing. The FGFR isoforms and their receptors (FGFRs) considered as a potential targets and under intense research to design potential anticancer agents. Fibroblast growth factors (FGF’s) and its growth factor receptors (FGFR) plays vital role in one of the critical pathway in monitoring angiogenesis. In the current study, quantitative pharmacophore models were generated and validated using known FGFR1 inhibitors. The pharmacophore models were generated using a set of 28 compounds (training). The top pharmacophore model was selected and validated using a set of 126 compounds (test set) and also using external validation. 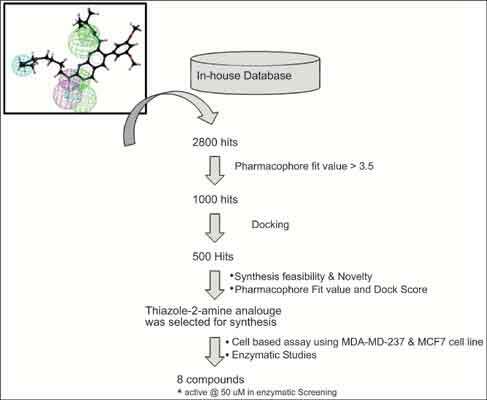 The validated pharmacophore was considered as a virtual screening query to screen a database of 400,000 virtual molecules and pharmacophore model retrieved 2800 hits. The retrieved hits were subsequently filtered based on the fit value. The selected hits were subjected for docking studies to observe the binding modes of the retrieved hits and also to reduce the false positives. One of the potential hits (thiazole-2-amine derivative) was selected based the pharmacophore fit value, dock score, and synthetic feasibility. A few analogues of the thiazole-2-amine derivative were synthesized. These compounds were screened for FGFR1 activity and anti-proliferative studies. The top active compound showed 56.87% inhibition of FGFR1 activity at 50 µM and also showed good cellular activity. Further optimization of thiazole-2-amine derivatives is in progress. Cancer, docking, FGFR1, homology modeling, pharmacophore, virtual screening. GVK Biosciences Pvt. Ltd., Phase-1, Technocrats Industrial Estate, Balanagar 500037, Andhra Pradesh, India.